Request loan of the spectrometers through the online request form. Loans will be filled based on a first-requested-first-served basis. Institutions must be in the United States (including Puerto Rico and the US Virgin Islands). 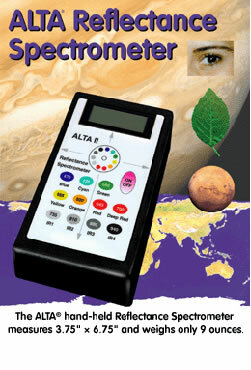 We require at least 5 days advanced notice to ship an ALTA kit. After the request has been received, LPI will contact you with any questions, and will follow up with a link for an online loan agreement 1 to 2 months before the loan period, which must be completed within 10 days of the email in order to retain the ALTA kit reservation. Recipients will need to either use a credit card to cover the $100 shipping fees (which include a return shipping label), provide their own shipping account for LPI to use, or agree to pick up and return the ALTA set in person. Agree to return all contents of the ALTA® Reflectance Spectrometer classroom set packed in the same manner as it arrived. The materials must be returned on the agreed-upon date, using a carrier that provides tracking information. After borrowing the ALTAs, please fill out the online survey of how the ALTAs were used.